Reaping Season, Bloodshed Beyond, the band’s third full length studio album, was created by original members A. and M., assisted by several session and guest musicians. Eleven hymns, having a total running time of fifty-two minutes, made it to the CD-edition, which was released, once again, via W.T.C. Productions aka the World Terror Committee. The result was mastered at the famous Temple Of Disharmony with Patrick M. Engel think: Nemesis Sopor, Sunshine And Lollipops, Chaos Echoes, Wigrid, Hellish Crossfire and many, many more). 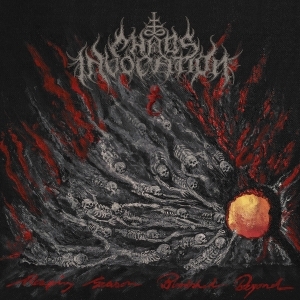 Chaos Invocation bring more than just ‘songs’, for they do use quite some atypical elements too. MenSkinDrums Of Doom, for example, is one of those compositions that has a lot more to offer than any average Death / Black formation. It’s about these unique drum patterns, the fine equilibrium in between blasting outbursts and some doomier fragments, or that balance in between epic melodies and devastating rhythms. Actually, all tracks have several characteristic elements, distinctive from the grey masses. It’s created with depth and performed with craftsmanship, and therefor recommendable. Also semi-acoustic interludes, different vocal additions (spoken words, grunts, choirs and so on) and permanently interacting changes in structure and tempo do typify this self-conscious project.